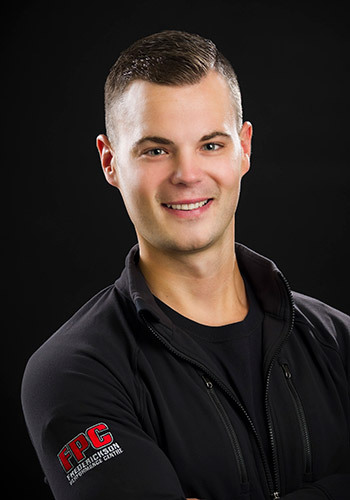 Having a strong background in numerous sports, including varsity high school athletics and Junior Hockey in Manitoba, Tyler followed his love of fitness, sport, and coaching by attending Brandon University to pursue an education degree. While doing so, he discovered his passion for education on a different level and continued his knowledge in the direction of Personal Training. He successfully completed the initial certification process for Personal Training through the National Academy of Sports Medicine (NASM) in addition to subsequently continuing his learning , graduating with honors in 2015 from the faculty of Health Sciences, in the Certified Personal Fitness Trainer Program, from the Northern Applied Institute of Technology. (Edmonton, AB). He has also successfully completed Phases 1, 2 and 3 of the Athlete’s Performance Mentorship program, based in Phoenix, AZ. Since joining the FPC team in 2010, he continues to work with a portfolio of clients from youth to business executives, to professional level athletes…in all aspects of wellness including strength training, weight management, general fitness and nutrition , as well as competitive athletes of all ages. He also co-ordinates the FPC off season dryland hockey program for numerous high profile hockey players and prospects, including several from the WHL’s Brandon Wheat Kings. His passion is working with people, and bringing out the best in them for a better overall lifestyle. He personally follows disciplined training regime, with a combination of strength, cardio, and power, as well as a committed nutrition program. In early 2017, he was given the opportunity to lead another team, the FPC team, through a transition of ownership which was soon after completed. He has enjoyed this process, working closer than ever before with his team, and expanding the role FPC has in the community. Whether you are looking to take your sport performance to a new level, or simply want to make a positive difference in your own life, Tyler and his team of professionals are committed to working with you to reach your goals.